Last week I went to Urban Worm Girl to buy some red wiggler worms and made a compost bin using instructions they provided. I was able to find a bin with a small crack at the local Family Dollar store and got a 33% discount. 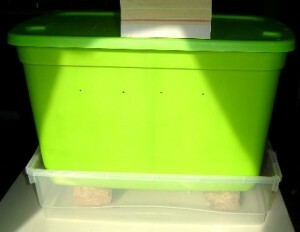 I placed a larger bin on top of two clay bricks set into a shallower bin meant to collect “worm tea”. I filled the bin with shredded newspaper and started feeding them after two days so they got settled in first. I save my veggie scraps in the fridge and use a food processor to chop it into smaller bits. It’s been over a week now and the bin smells like wet dirt, not rotting veggies. The worms eat about half their weight every day and will double in population every four months. By the end of the year I should have enough worms to eat all my food garbage. Besides diverting some garbage from the waste stream I get a rich compost that I can give my house plants and container garden (more about that later).